Share the post "Paeonia Tenuifolia Or Fern Leaf Peony"
Paeonia tenuifolia, common name is the Fern Leaf Peony. It is native to the Caucasus Mountains of Russia, as well as areas in Ukraine north of the Black Sea and westward into Romania, Serbia, Yugoslavia, Bulgaria. Paeonia tenuifolia is so remarkable that it has long been known to gardeners. In 1759 it was one of the peony species identified by Linnaeus, but it must have been known in German gardens as early as 1594. Also Mrs. Frank states that Paeonia tenuifolia was raised at the beginning of the 16th century by a nursery in London for commercial purposes. For the English speaking world Alice Harding reports the introduction of Paeonia tenuifolia in 1765 to England and to America in 1806. Its natural habitat is in dry grassland and dry stony hillsides, sometimes in scrub, sometimes on limestone. It is hardy to USDA Zone 3 or colder, growable from coast to coast in Canada although possibly not exactly a good doer along the east coast in wetter winters. Fern Leaf Peony can reach between 30 and 60 centimeters in height. The flowers are red and scented with numerous yellow stamens in the centre. The narrow, divided light-green fern-like leaves are almost thread-like and grow close together on the stems. This plant is perfect for edging or in a sunny rock garden. Flowers appear earlier than the more common hybrid Garden Peonies. Paeonia tenuifolia may go summer dormant in warm regions. Peonies seldom need to be divided or moved, but if necessary it should be carried out only in the fall. Trim off old stems to the ground in late fall, to help prevent disease problems. P. tenuifolia are characterized by an arid continental climate, hard winters and hot, dry summers. In areas with a temperate climate the whole year round and a high humidity one has difficulty in growing P. tenuifolia. successfully. P. tenuifolia belongs to the “Hemicryptophytes” (8/462) That means its buds may only be slightly covered by the soil. We all know this fact – peonies don’t want to be planted too deeply or they will not bloom anymore. Soil: well-drained, light, rich, neutral to slightly alkaline, moderately moist or dry soil. Most preferred black soil with high calcium carbonate content. Water: requires good winter drainage, being less tolerant of wet soil than most other species, and in drier climates may tend to go dormant in mid- to late- summer unless irrigated i.e. the foliage turns brown and dies down. Propagation and germination: raise them from seeds, which are sown in light fertile soil in the fall. Also possible by dividing rhizomes. P. tenuifolia has epigeal germination, while most of the other species are hypogeal. Transplant P. tenuifolia in late August to early September, as the formation of roots, same as other species of peonies, takes place in autumn. Potted peonies may be transplanted in the spring or the fall. Fertilizer: Feed fern leaf peonies with a mixture of bonemeal and either compost or well-rotted manure in the fall before the foliage fades. If you prefer to use a commercial fertilizer, choose one with a lower percentage of nitrogen than phosphorous and potassium. High levels of nitrogen lead to fewer flowers. 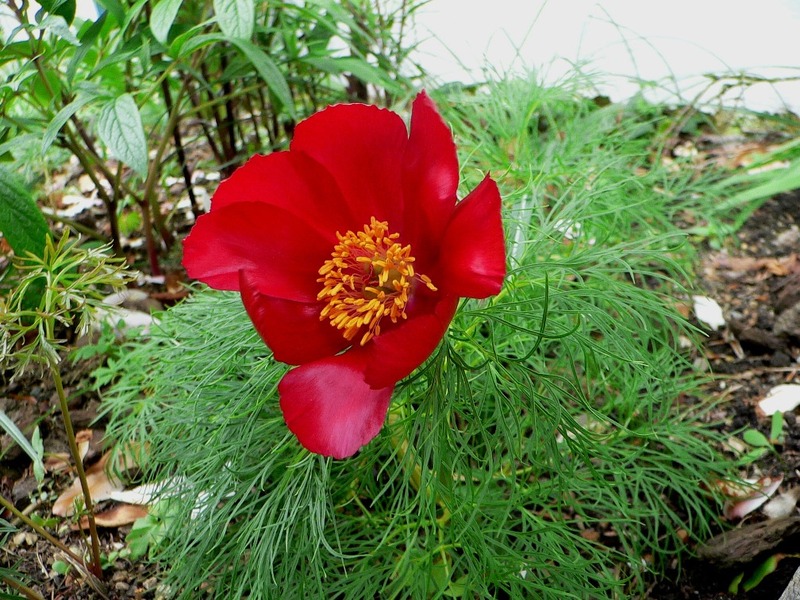 Do you grow Paeonia tenuifolia (Fern Leaf Peony) in your garden? What is your experience with this plant? Please share in the comments below! Do you sell Paeonia tenuifolia (Fern Leaf Peony) seeds or have plants for sale? You can place your advertisement here. Contact us now!